"I'm going to sit down and have a serious conversation with my coach tomorrow and see if I can actually play by NFL rules and still be effective. If not, I may have to give up playing football." Those are the words of James Harrison, obviously confused about how he should play in the New NFL that begins on Sunday. The comments were made last night to Fox Sports Radio's "Into The Night with Tony Bruno" guest host Judy McDonald. Added Harrison: "I really truly hope it's something that can be done. But the way that things were being explained to me today and the reasoning for it, I don't feel I can continue to play and be effective and, like I say, not have to worry about injuring someone else or risking injury to myself." While I don't expect Harrison to really retire, his state of mind is at least fragile enough for Mike Tomlin to give him the day off today after the two had a meeting this morning. "That's exactly true,'' Parise said. "He met with the coach and left for today. He's in the process of contemplating is it possible to play football under these new rules . . . 'if I go to work and tackle somebody and get a fine.'" Parise said there is "no fighting, no arguing," just discussions. He said Harrison has been talking with his coaches, the Steelers, his mother and the agent. 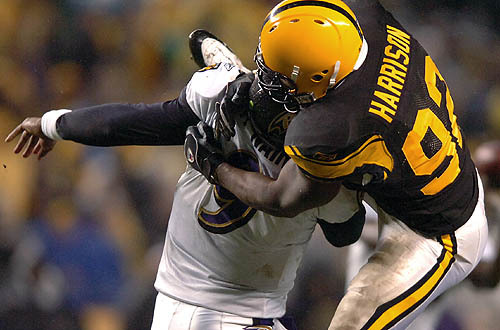 Harrison signed a six-year, $51.2 million contract in April 2009 that included a reported $20 million in bonuses. If Harrison would retire before the contract expires, the Steelers could demand he pay back some of those bonuses. Like I said, I really can't see how Harrison walks away (and I don't think he will), but I can understand his frustration. For a league to arbitrarily change the enforcement of a rule after a particularly rough weekend is surprisingly knee-jerk. Harrison's an emotional guy and sometimes beats to his own drum, so this is probably just his natural reaction to a situation he sees as perplexing. The Steelers will be able to eventually calm down #92, but it's shaping up to be a very interesting weekend around the league if this is going to be the reaction of some of its top defensive players. I don't think people should brush this off as a non-issue. I just can't believe how often Pittsburgh players are at the center of media-lead witch hunts anymore. Look at the reaction Cooke's hit after Bitchards had done worse earlier in the year. Look at QB1's recent saga. I mean, this league supposedly coddles and favors us, but after 2008 2 rules were implemented because of Clark and Ward hitting people too hard. I am off to make a tin foil hat now. There will be suspensions this weekend. Several NFL officials have warned that if these fines don't work, there will be suspensions. I guess they have to create parity some way. It wasn't blatant helmet-to-helmet (it looked more like he led with the shoulder, the player lowered himself, and got hit in the helmet with the shoulder pads) and he didn't leave his feet. But the NFL said it was illegal. That's a totally subjective call (unlike the Meriweather hit where he left his feet, and launched himself helmet first into an airborn player). If they can just start penalizing, fining, and suspending guys for plays that, while they don't meet the former criteria for "illegal" by the NFL, are deemed to be too vicious? And if that's the case, what's to stop offensive players who embellish after they take a hard, legal, hit in order to draw a flag and a suspension for one of the opposition's better players? Burress, there is one haa-uuge hole in your arguement. I have it on reliable sources out of Philly and Seattle and numerous other spots around the country that both Bettman and Goodell both pull out every stop to make sure that they're respective Pittsburgh franchises win the championships every year. Well, Harrison showed up for work today. My only hope is that on Sunday, he doesn't lose his mind and punch a ref when there are no holding calls against the Dolphins.